A second round of greetings come from our Howloween mascot...Leia. It was close for a while. But in the end, Leia outlasted the Doggie Nun 137 - 108. This is a bit upsetting, as I was really pulling for the Nun to win. I was gonna give her a regular column, like Desperate Housewives recap from the YesBut Nun, or The YesBut Nun on the situation in Pakistan. 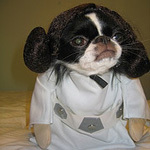 But no, we've got a Leia Dog for a mascot. Oh well...any ideas on what to do with her would be greatly appreciated.